These are easy. Like, throw TWO ingredients into a bowl and bake, easy. I’m not a cake mix hater. I prefer homemade, but there are times when a quick mix comes in handy. Back in my selling Pampered Chef days, one of my favorite recipes to share was to make a Bundt cake and use only three ingredients. One box of cake mix, 3 eggs, and a can of pie filling. You put into your Stoneware Bundt pan and MICROWAVE for 12 minutes. Super moist, delish, and perfect when you have a surprise guest drop on by. Unfortunately, I don’t think all of you have Stoneware Bundt pans. Do you? You should. It rocks. But, I was low on the egg department and I had a huge taste for coconut. Especially after eyeballing the Coconut M&M’s at the grocery store. Have any of you tried them? Are they any good? 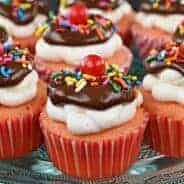 Back to these cupcakes. Here is where trust is important. You MUST trust me. Look into my eyes. Deep into my eyes. Hello! Take one box of yellow cake mix and one can of crushed pineapple with the juice. Unite and rejoice. These are so moist you don’t even need any frosting. I wanted to go pretty light, so I made a frosting with whipped topping, 1/3 less fat cream cheese and a few other things. 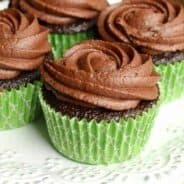 You decide how you like your cupcakes. One thing though, the topping is very light, so I suggest you “frost” them right before eating. I have a bowl of the frosting in the fridge, so we can scoop it as needed. Oh, and it’s really good on graham crackers too. Just sayin. In large bowl, mix yellow cake mix with crushed pineapple and juice. Fill cupcakes about 2/3 full. Bake in a 350 degree oven for 18-20 minutes. Cool. I toast my own coconut and store in a ziploc for later use. To make, on cookie sheet spread out 10oz bag of unsweetened coconut flakes. Bake in a 300 degree oven for 20 minutes, stirring every 5 minutes. To make frosting, beat cream cheese, milk, honey and rum extract. Fold in pineapple and 1/2 cup toasted coconut. Add cool whip. 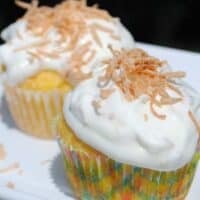 Frost each cupcake and sprinkle on some of the reserved coconut. Enjoy cold. Wow, that is easy. You can’t beat that. What a simple idea! And, a great way to cut the fat (if you’re in to that sort of thing…) Love it. Thanks for sharing on Sweet Indulgences Sunday. Such great flavors! Thank you so much for joining Fat Camp Friday! See you next week! 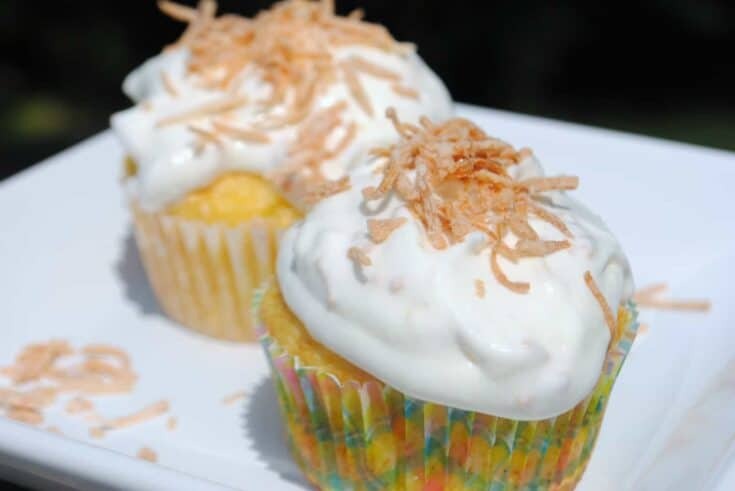 Mmmm…I love pineapple and coconut! 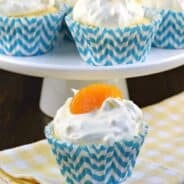 What a great easy and delicious recipe! Pineapple and coconut is one of my fave flavour combos, thanks for the tip! Also YES coconut m&m’s are amazing! and definitely pick up multiple bags next time you see them in your supermarket – you don’t know how lucky you are! We don’t get them here in England so I have to spend ridunculous amounts of cash on them when I buy them in imported U.S candy shops! but it’s worth it!